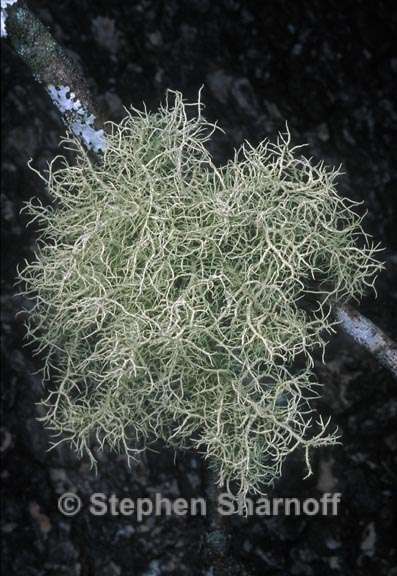 Thallus: erect-shrubby, up to 5-7 cm long, compact and densely branched branching: isotomic-dichotomous, divergent basal part: distinctly jet black with few annular cracks (very rarely concolorous with the branches) branches: tapered; lateral branches: not narrowed at attachment points segments: terete, cylindrical papillae: few to numerous, verrucous, irregular tubercles and fibercles: generally absent fibrils: slender and ±long (±3 mm when mature), few to numerous especially on main branches, ±regular soralia: punctiform, irregular, smaller than half of the diameter of the branch, arising initially on the cortex, slightly stipitate, ±erumpent, sometimes fusing together and looking like a large soralia, generally numerous, covering the terminal branches isidiomorphs: short and spinulous, numerous especially on young soralia but present on mature soralia as well pseudocyphellae: absent cortex: thick (8-12%), dull to shiny medulla: usually thin, dense to compact, not pigmented axis: moderately thick, not pigmented Apothecia: not seen Spot tests: K+ intensely yellow turning slowly orange, C-, KC-, P+ orange or K-, C-, KC-, P- Secondary metabolites: either thamnolic acid (major), ±squamatic acid (minor) or squamatic acid (major) alone. Substrate and ecology: on bark (especially Quercus spp. ), rarely on wood, coastal, mainly on in small oak forests or on diverse shrubs in the chaparral between 200 and 500 m or inland in the mountains on Quercus spp. and Pinus spp. between 1500 and 2800 m World distribution: Eurasia, Macaronesia, and North America Sonoran distribution: coastal, southern California (frequent in the Channel Islands) and Baja California; rare in the mountains of SE Arizona and Chihuahua. Notes: Its black pigmented basal part, its isotomic-dichotomous ramification pattern, its terete and cylindrical branch segments, its minute soralia with numerous isidiomorphs and the production of thamnolic ±squamatic acid or squamatic acid alone in the medulla are diagnostic characters for U. subfloridana. For differences from U. praetervisa, see under this species. There is a rare morphotype collected on Santa Catalina Island with nearly concave and enlarged soralia.